Darkseid is dead. Felled in his war with the Anti-Monitor, the consequences of his death and its catastrophic effects for those involved in the battle were felt immediately, but especially so by the Justice League. Granted the power of omnipotence in the wake of – and just before in Batman’s case, assuming the mantle when he toppled Metron – Darkseid’s passing, in Power of the Gods, the members of the Justice League “granted” this troubling boon strive to come to terms with “Godhood” and all that it entails. Batman, assuming the avatar of the God of Knowledge attempts to pre-emptively cleanse Gotham of crime in a logical, if somewhat totalitarian, series of first strike arrests. He then uses his all-encompassing wisdom for his own benefit before finally focussing on the root of all of Gotham’s woes. Superman meanwhile, imbued with absolute raw power as the God of Strength, becomes a slave to that power; and trapped within its embrace begins to forget who he is and what he represents to humanity. While Green Lantern watches his brothers and sisters fall as Darkseid’s power attempts to merge with the battery on Oa, and he takes a decidedly different path to his comrades in arms, no doubt partly influenced by his experience of being, and dealing with, Parallax. Flash attempts to outrun and escape his post Darkseid destiny, but is ultimately shown the folly of his life-long struggle and reluctantly adopts his new persona and Shazam is forced to meet, deal, greet and accept a whole new pantheon as his links to the Old Gods disappear and his bargain with the new Deities is forged. 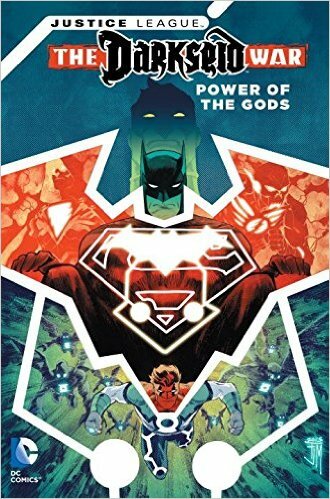 It’s a weighty, engaging set of stories that illuminates and explores the way in which the personalities of the team members and their individual experiences shape the decisions they make when confronted with the opportunity to become a “God”.